President Vladimir Putin said on Wednesday that Russia has identified the two men that Britain named as suspects in the poisoning of a former Russian spy, and that there is "nothing criminal" about them. MOSCOW (AP) — President Vladimir Putin said Wednesday that Russian authorities know the identities of the two men accused by Britain of carrying out a nerve agent attack on a former spy, but he added that they are civilians and there is “nothing criminal” about them. The statement by Putin marked an abrupt shift from Russia’s earlier position on the poisoning case that has damaged relations between Moscow and the West. Initially, Russian officials said they had no idea who the men were and questioned the authenticity of some of security-camera photos and video released by Scotland Yard showing them in London and Salisbury, where the poisoning took place. 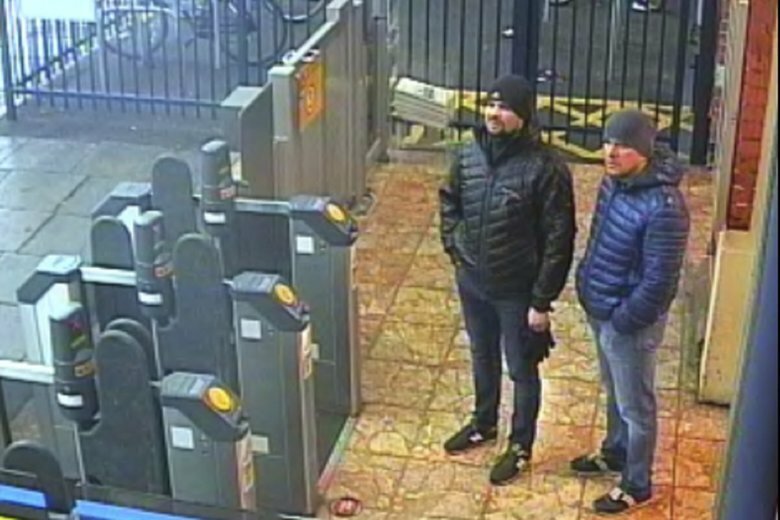 Britain last week charged two men in absentia, identifying them as Alexander Petrov and Ruslan Boshirov. Authorities alleged they were agents of Russia’s military intelligence agency known as the GRU and accused them of poisoning former Russian spy Sergei Skripal and his daughter, Yulia, in Salisbury on March 4. Asked by the panel’s moderator if the men work for the military, Putin replied that they are “civilians” and called on the men to come forward and speak to the media. The Skripals’ poisoning by the deadly nerve agent Novichok triggered a tense diplomatic showdown. Britain and more than two dozen other countries expelled a total of 150 Russian diplomats, and Russia kicked out a similar number of those countries’ envoys. Putin’s abrupt shift from earlier official statements on the case fits a pattern by the Russian leader. When troops in uniforms without insignia first appeared on the streets of Ukraine’s Crimean Peninsula in 2014 prior to its annexation, Putin insisted that they were not members of the Russian military, but merely local volunteers. Weeks later, Putin said there were Russian troops present there under a treaty with Ukraine that allowed Russia to leave a naval base in Crimea. Similarly, Putin initially dismissed accusations of Russian state-sponsored hacking in the U.S. election system, but he later admitted the possibility that it was the work of some “patriotic-minded” Russians, although he denied that any of them had been directed by the Kremlin. After British authorities released photos and video of the men, Russian Foreign Ministry spokeswoman Maria Zakharova alleged that two of the photos in a London airport had been doctored. She later walked back that statement, expressing frustration that British authorities had not shared the files with their Russian counterparts, leaving Moscow “guessing” about what really happened in Salisbury. Moscow also questioned the origins of the nerve agent involved in the attack, saying it was not proven that the substance was developed by Russia and arguing that other countries, including Britain, had the capacity. Although Novichok is said to be extremely lethal, the Skripals survived, and Russian authorities even questioned why British officials put down the Skripals’ pets. “There have never been and never will be such stupid people in Russian intelligence,” journalist Nikolai Dolgopolov, who has written widely about spies, said on Vesti Nedeli. Skripal’s niece Viktoria, who lives in Russia and often voices pro-Kremlin arguments on Russian television talk shows, told the Interfax news agency Wednesday that she knows “through her own sources” that the men identified as Petrov and Boshirov are “ordinary men” who are “shocked” by the accusations. A British inquiry concluded that Litvinenko had been killed at the behest of the Russian state, probably with the president’s knowledge.